The name Manzano’s… it sounds appetising, and (probably only because it sounds like Manana) relaxing. You experience the world differently if your Spanish is next-to-non-existent. Googling the word yields interpretations of apple trees and mountainous regions, which are very chilled things so it turns out that my Spanish is better than I thought. And Manzano’s was pretty chilled. We came in and they told us to sit where ever. This did not include in the downstairs bar where it was clear a party was going on … and that really did sound like a party. The seat we chose was next to a wall aptly plastered with pages from a Spanish English dictionary. Excellent, my promising start in Spanish was about to be developed, so long as the conversation would be made up of words beginning only with ‘n’. I was playing my ‘not my turn to drive’ card heavy. This was easy as my husband was driving the toy car, the one that I probably can technically drive, but perhaps shouldn’t try, when the idea struck us to eat here. 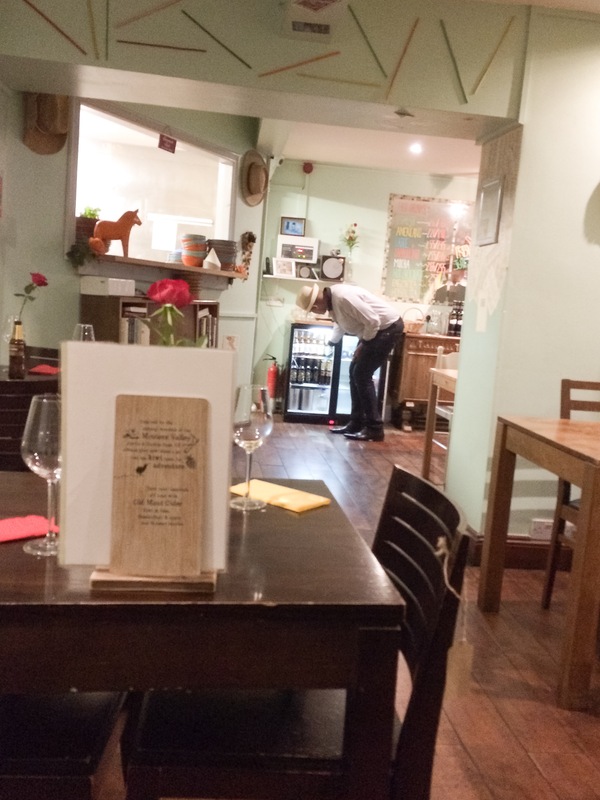 So I launched straight in with the South American shots of Manzanita (probably also translates as ‘tomorrow’ too, right…? it begins with ‘man’) which was aniseedy without being too sweet. I failed to drink it as a shot. I am not a shot kind of a lady, I like to taste what I drink. We started with earthy tasting chorizo, and plantain, the sweetness of which was a great combination with the hot green chilli salsa. 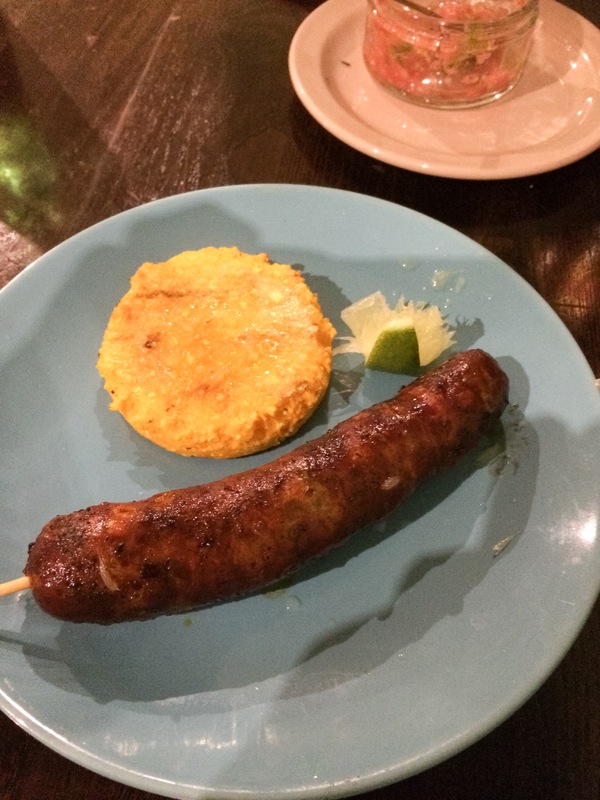 Even though we knew that we have chorizo with the main dish, the chorizo on the starter came with corn bread. I have had good experiences with corn bread in the past, and I was not going to miss that. 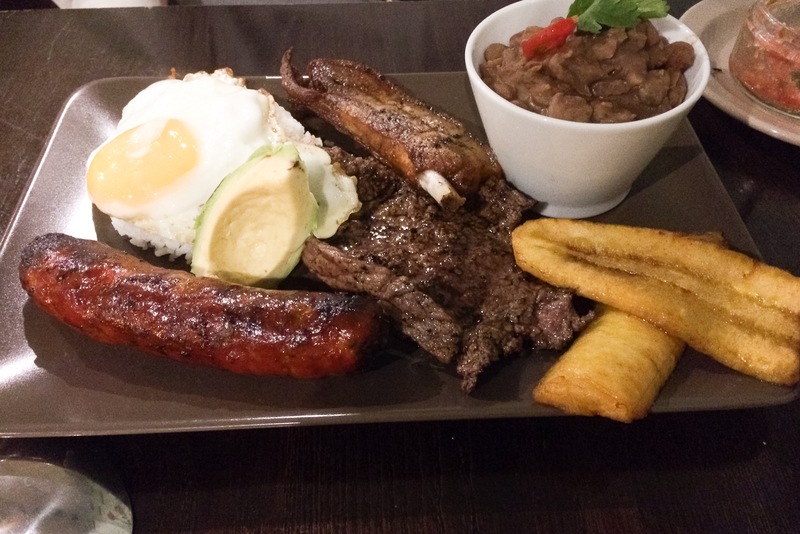 The salad bowl that came out was absolutely enormous and we shared the nearly mixed grill, but not actually mixed grill… Bandeja Paisa, made up of more chorizo, fried pork belly (as if pork belly was not fatty enough), rice, beef, plantain egg and avocado. This also came with beans, the most delicious beans that really deserved calling out for their deliciousness. But we had no dessert… This was a huge mistake to leave us without dessert menu. We were offered something but left the restaurant debating whether we had actually been offered a dessert or a top up of beer. Maybe it was me. They saw that I needed to eat less. Probably good for me.